Gray Gibson has developed ideas for original characters, including “The Comeback Kid,” a boomerang-wielding cowboy. Photo by Jon Mirador. Within the pages of a small black sketchbook, illustrations of cowboys, dinosaurs and aliens come alive with vibrant colors and careful lines. On the cover, a bright red sticker in the shape of a futuristic ray gun arms the little book, guarding its bounded pages. 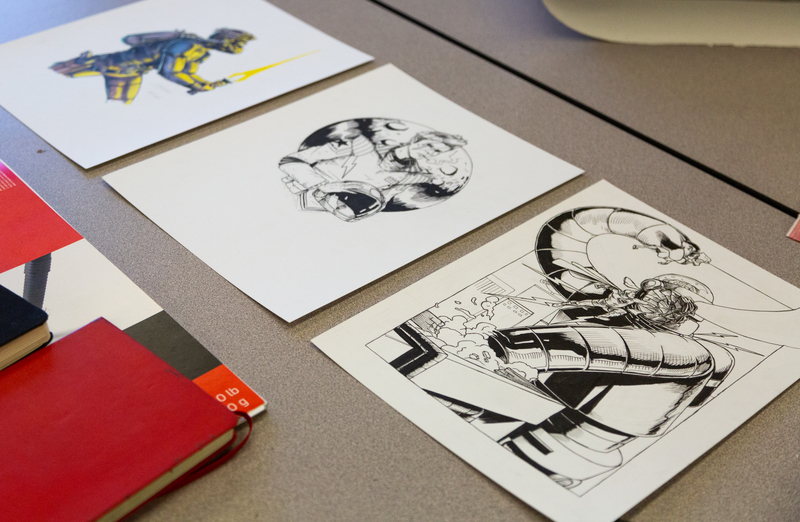 The drawings belong to VCU sophomore Gray Gibson. 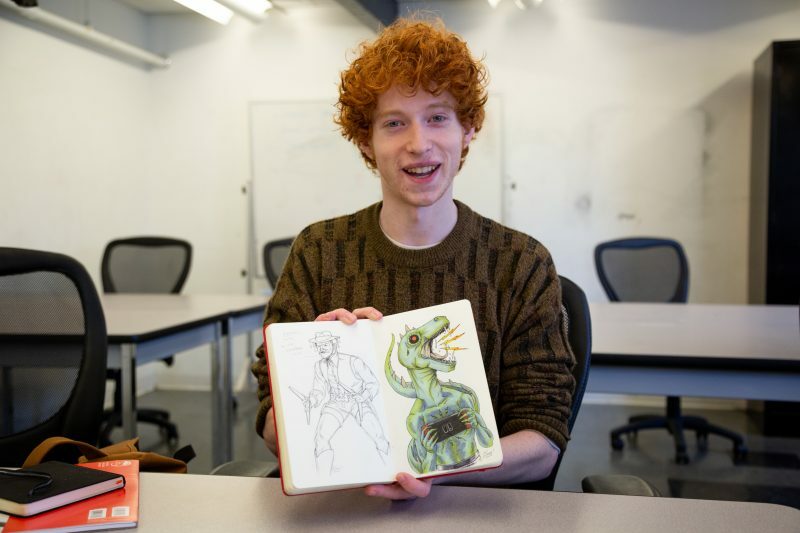 He has mimicked famous illustrators since elementary school, but he recently started drawing original characters. As he explores his own style today, his future and the reality of drawing for hire looms ahead of him. Both of Gibson’s parents are artists, and his sister recently graduated from VCU with a degree in graphic design. Today, Gibson immerses himself in the style of comic books to create a personal escape from the real world. Gibson finds inspiration from a collection of comic book artists, including Chris Samnee, Darwyn Cooke and Ryan Heshka. But he said many of his recent ideas have spurred from collaborating with his classmates. 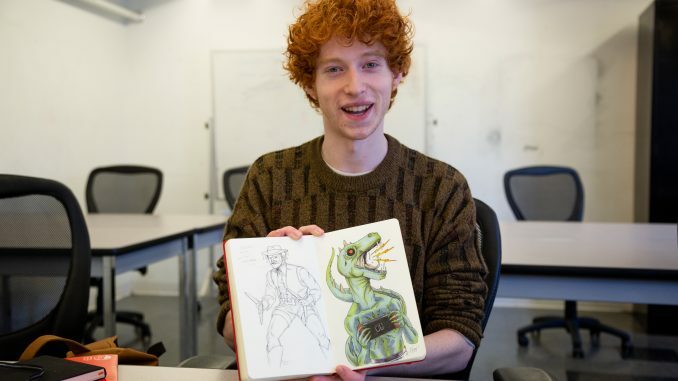 Because of the environment Gibson enjoys at VCU, he said his focus has shifted as an artist. While he still wants to be a comics illustrator, he no longer wants to work for big names such as Marvel and DC. One of the characters Gibson has created is called “The Comeback Kid.” The cowboy wields a boomerang as a weapon against his primary foe — the stingray that killed Steve Irwin. This summer, Gibson wants to take his work to the annual Richmond Zine Fest. While he has personal concepts, he said he wants to adapt them for the comic marketplace and make them more accessible for readers. Gibson said he struggles with the capitalist reality of making art, but he wants to find ways to make money from his own style.